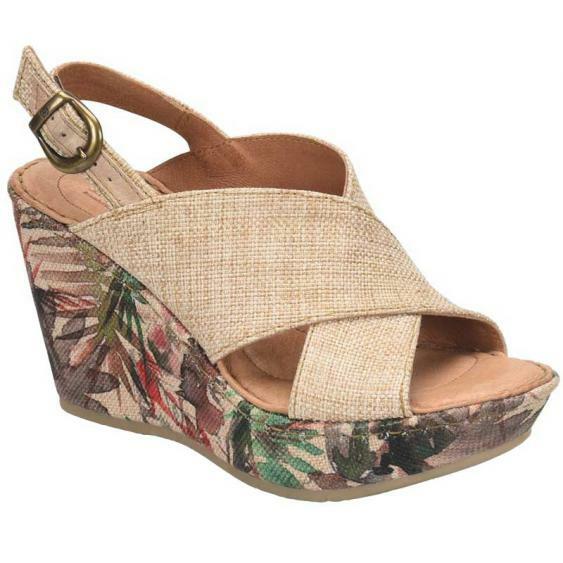 The wedge is a summer essential and we’ve got the perfect one for you; the Born Emmy II. This versatile heeled sandal has an upper made of fabric with a soft lining to wick away moisture. The leather wrapped footbed provides instant cushion and Born’s Opanka construction keeps the Emmy II lightweight while still being durable. The 3 ¾” wedge is either leather or fabric wrapped and the PU outsole provides stability even with the added height. Fun summer skirts, jeans, or dresses the Emmy II is versatile enough for it all. These are very comfortable shoes! The footbed is nicely padded & the heel strap keeps them snug on the feet. The colors in the print on the wedge are exactly as shown. I normally wear a size 7 1/2 or 8 shoe. I purchased these in a size 7 & they fit perfect. I fell in love with these wedges at first sight! I received them and they are comfortable and true to size and fit! They can go with all my island vacation outfits!